Aquatic invasive species (AIS) are biological pollutants that cause detrimental ecological, economic, and humanhealth effects in their introduced communities. With increasing globalization through maritime trade, ports are vulnerable to AIS exposure via commercial vessels. 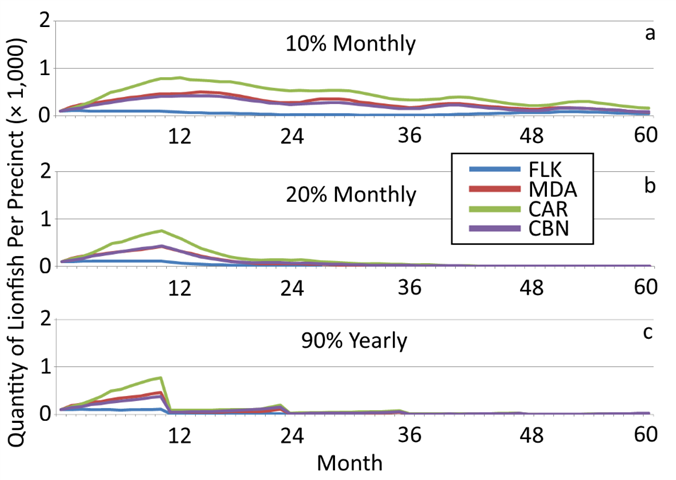 The Cuban Port of Mariel is poised to become a competitive transshipment hub in the Caribbean and the intent of this study was to evaluate present and potential impacts AIS pose with the likely future increase in shipping activity. We utilized previous assessment frameworks and publicly accessible information to rank AIS by level of threat. Fifteen AIS were identified in Cuba and one, the Asian green mussel Perna viridis (Linnaeus, 1758), had repeated harmful economic impacts. Five species associated with trade partners of Port Mariel were considered potentially detrimental to Cuba if introduced through shipping routes. The results presented herein identify species of concern and emphasize the importance of prioritizing AIS prevention and management within Cuba. Marine connectivity over seascapes enables the persistence of metapopulations and is often regulated in part by an organism’s pelagic larval duration (PLD), fecundity, mortality, and ocean conditions. 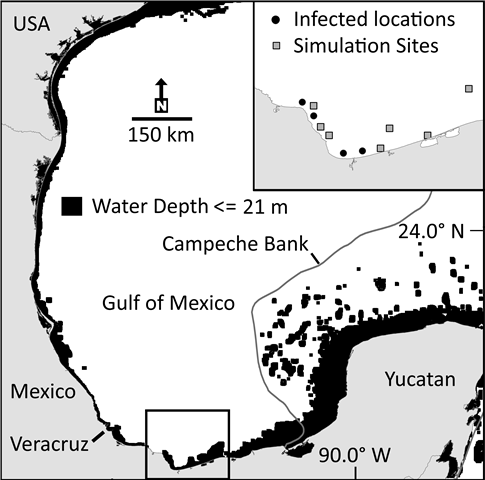 The Campeche Bank (CB) in the southern Gulf of Mexico flanks the strong-flowing Loop Current and is important ecologically and economically in the context of mesoscale connectivity to the Gulf. 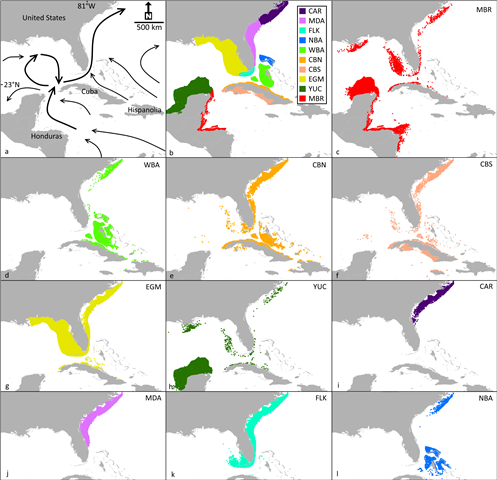 Here we use a biophysical model to examine connectivity between the CB and the north-eastern Gulf (NEGOM) of simulated populations of lionfish (Pterois volitans/miles), red grouper (Epinephelus morio), and a generic marine organism. 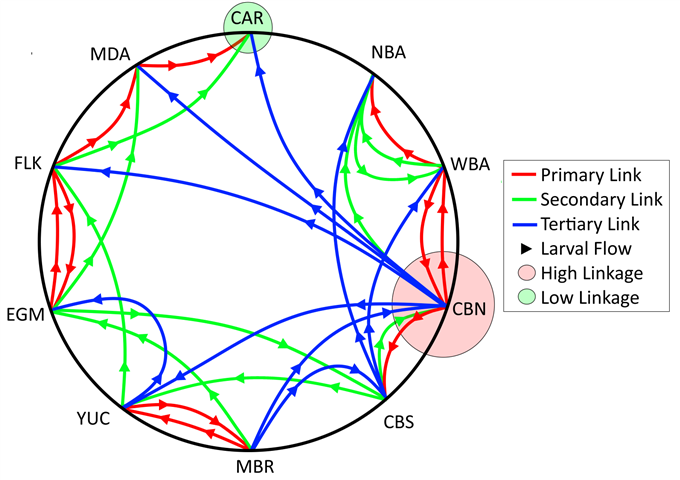 Our purpose was to assess longitudinal connectivity across the CB to the NEGOM and also to quantify this connectivity over a range of PLDs and organism fecundities. From this work, we find that portions of the north-eastern perimeter of the CB in water depths between 50-300 m are the majority sources of lionfish and red grouper recruits to the NEGOM. This finding is important as deep waters on the bank are often heavily targeted by commercial fishers and are also beyond the reach of present lionfish control regimes. We also demonstrate that buoyant larvae must remain in the water column for a minimum of ten days to reach the NEGOM from the CB given prevailing water flow, though 45-50 days provides maximum connectivity. These findings are relevant for invasive species control, fisheries management, ecosystem services, and to preserve metapopulations of marine fauna sympatric to the both regions. 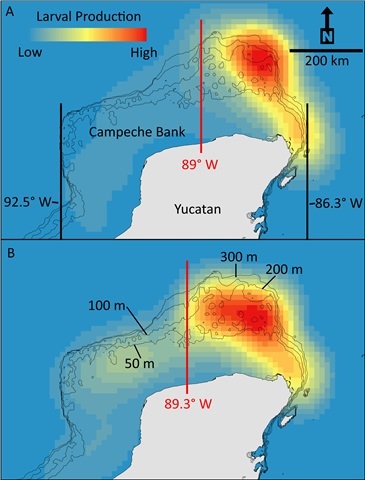 Johnston MW, Bernard AB (2017) A bank divided: quantifying a spatial and temporal connectivity break between the Campeche Bank and the north-eastern Gulf of Mexico. Marine Biology 164(1), 1-15. Invasive lionfish (Pterois volitans/miles complex) now permeate the entire tropical western Atlantic, Caribbean Sea, and Gulf of Mexico but lionfish abundance has been measured only in select locations in the field. Despite its rapid range expansion, a comprehensive meta-population analysis of lionfish ‘sources’ and ‘sinks’ and consequentially the invader’s potential abundance and impacts on economically important, sympatric reef fishes have not been assessed. These data are urgently needed to spatially direct control efforts and to plan for and perhaps mitigate lionfish-caused damage. Here we use a biophysical computer model to: (1) forecast larval lionfish sources and sinks that are also delineated as low to high lionfish ‘density zones’ throughout their invaded range, and (2) assess the potential vulnerability of five grouper and snapper species — Epinephelus morio, Mycteroperca microlepis, E. flavolimbatus, Lutjanus campechanus, and Rhomboplites aurorubens — to lionfish within these density zones in the Gulf of Mexico. Our results suggest that the west Florida shelf and nearshore waters of Texas, USA, and Guyana, South America, function both as lionfish sources and sinks and should be high priority for targeted lionfish control. Furthermore, of the five groupers and snappers studied, the high fishery value E. morio (red grouper) is the Gulf of Mexico species most at risk from lionfish. 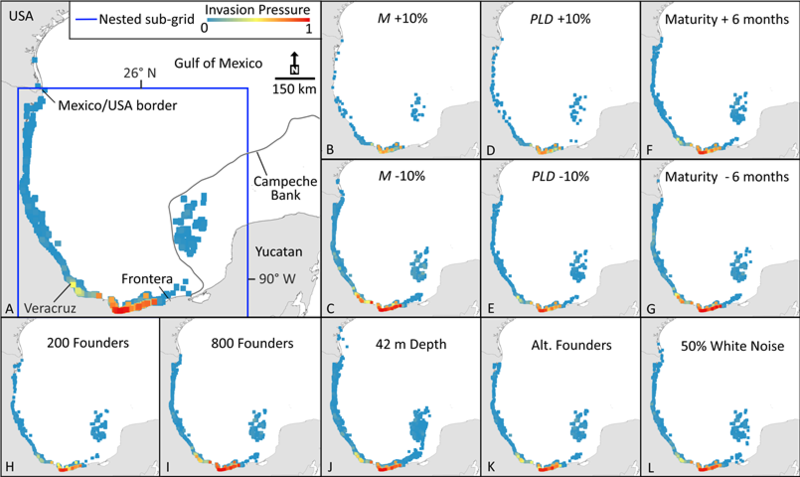 Lacking a comprehensive lionfish control policy, these risk exposure data inform managers where removals should be focused and demonstrate the risk to five sympatric native groupers and snappers in the Gulf of Mexico that may be susceptible to dense lionfish aggregations, should control efforts fail. The Non-native Royal Damsel (Neopomacentrus cyanomos) in the Southern Gulf of Mexico; An Invasion Risk? A diminutive, non-native damselfish (Neopomacentrus cyanomos) was recently discovered inhabiting coral reefs near Veracruz, Mexico - far removed from where it is native in the Red Sea and the Indo-pacific. 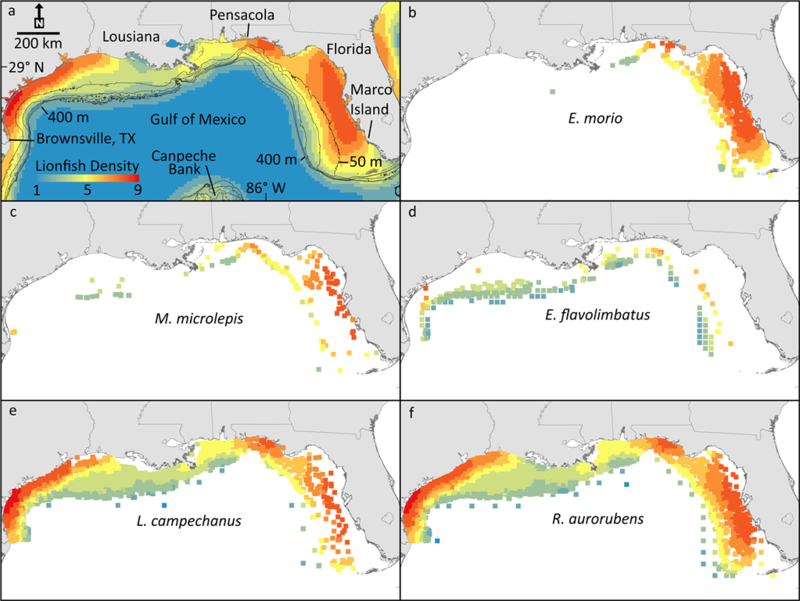 The quantities found in the Gulf of Mexico (GOM) suggest that the fish has already established a self-sustaining population in this new ecosystem. There is understandable concern, therefore, that this new arrival may become invasive and spread, yet the invasion risk imposed by this fish has not been assessed. In this study, a computer model was employed to deliver a forecast of the potential range of incursion of N. cyanomos in the GOM spanning five years. The model incorporated oceanic water flow in the region, tolerances of this damselfish to the ocean environment, and their reproductive strategy in order to supply a temporal and spatial forecast of their spread. From this study, targeted early detection and removal of the fish can be directed if the fish is deemed a threat to native fauna. On the basis of this work, it is foreseeable that the reefs presently harboring N. cyanomos will likely see increased abundance of this damsel. Immediate attempts to eliminate the fish, therefore, should be focused in nearshore shallow waters spanning Veracruz to Frontera, Mexico. Further, water flows in the southern GOM are not widely conducive to long distance transport of marine organisms with pelagic larvae, reducing the risk of this damsel permeating the greater GOM over five years. Aside from N. cyanomos, this study implicitly adds to mounting evidence supporting a biogeographic disconnect between the Veracruz reef complex and the greater GOM and the Caribbean. Johnston MW, Akins JL (2016) The Non-native Royal Damsel (Neopomacentrus cyanomos) in the Southern Gulf of Mexico; An Invasion Risk? Marine Biology 163(1), 1-14. 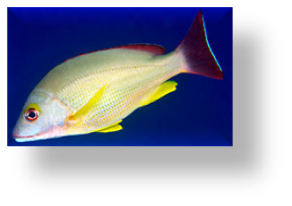 Eleven grouper, snapper, and emperor fish species were intentionally released in the Hawaiian Islands spanning the years 1955-1961 to produce new fisheries. Within 15 years, three of the introduced species established self-sustaining populations and eight did not. Two species, Lutjanus kasmira and Cephalopholis argus, are now considered invasive. We report on the results of a biophysical computer model which combines the life history traits of the inductees with prevailing oceanographic conditions in the Hawaiian Islands to hindcast the fate of the introduced fish. This comparative study is valuable in providing numeric insight into the characteristics that predispose fish introduced outside their native range to becoming invasive. Simulations created by the model spanning the years 1955-1970 succeeded to reproduce the establishment of the three species now found in the Hawaiian Islands and also replicated the failure of those fish that did not establish. Our results suggest that mortality rate, tolerance to water depth, age to maturity, and the quantity of individuals released are the best predictors of the establishment of the introduced fish in the Hawaiian Islands. 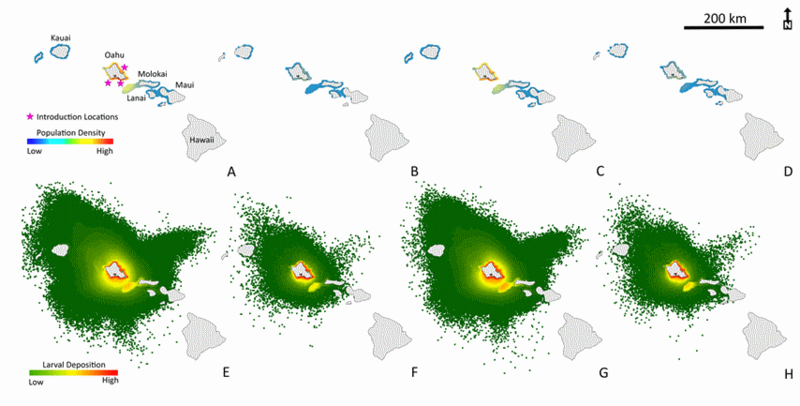 Johnston MW, Purkis SJ (2016) Forecasting the Success of Invasive Marine Species; Lessons Learned from Purposeful Reef Fish Releases in the Hawaiian Islands. Fisheries Research 176, 190-200. Marine ecological services provide goods, amenities, food resources, and economic benefits to millions of people globally. The loss of these services, attributed to the infiltration of marine invasive species such as the Indo-Pacific lionfish (Pterois volitans/miles), is measurable. The highly successful lionfish now flourishes in great densities in the US Gulf of Mexico and Atlantic waters and the entire Caribbean, yet the loss of ecological services attributed to the invader has not yet been assessed. In this study, we employ a derivative of a well-utilized method of ecosystem valuation known as habitat equivalency analysis to measure the time-value-adjusted loss of biomass- and recruitment-related ecosystem services brought by lionfish to Bahamian reefs. Drawing upon the literature examples of tangible lionfish damages in the Bahamas, we (1) quantitatively evaluate the loss of ecosystem services instigated by lionfish by measuring the total service-year losses partitioned over yearly time steps, (2) provide a metric by which ocean managers may value the remunerations of Bahamian lionfish controls when weighed against removal costs, and (3) deliver a tool to quantify changes in ecosystem services as a consequence of invasive species impacts and control. We found that the invader imposed losses of 26.67 and 21.67 years to recruitment and biomass services per km2 of Bahamian reef if left uncontrolled. 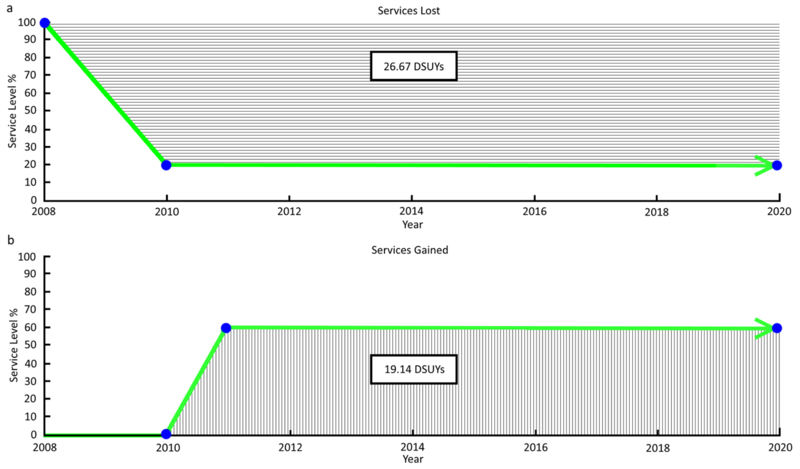 In the same accord, the most conservative Bahamian lionfish removal regime modeled, i.e., which produced a 50 % recovery of pre-lionfish ecosystem function over 10 years, provided service gains of 9.57 and 4.78 years per km2. These data deliver a platform upon which to quantify present and future fiscal costs of the lionfish invasion and also to value lionfish control efforts. Invasive Atlantic lionfish have demonstrated measurable ecosystem damages in their invaded range. As a matter of urgency, strategies to suppress lionfish have therefore risen to the fore amongst the ocean management community. We use a biophysical model and ocean climate data to demonstrate how Atlantic lionfish larvae are dispersed by currents and how this, combined with their breeding strategy, negates effective control using methods traditionally executed on a local scale. This study quantitatively emphasizes the high level of larval connectivity that exists between the many nations whose waters now support established lionfish populations. For any given area, our results indicate the key to suppressing the invasion is to simultaneously choke all upstream linkages that supply external larvae and renourish the local population. 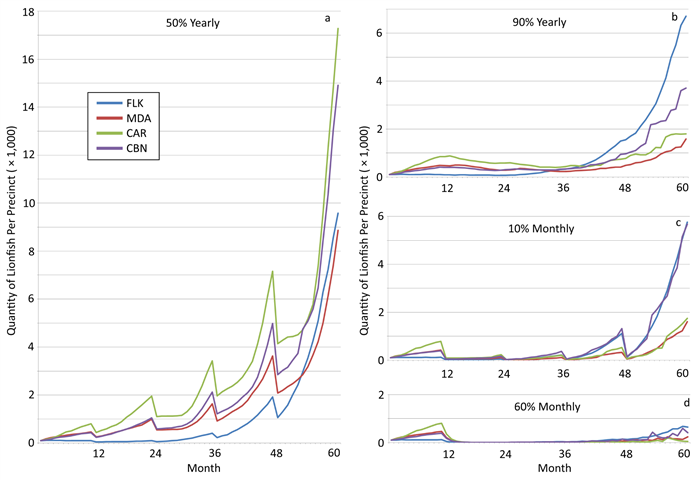 On the basis of a case study developed for the Carolinas, U.S.A., an area of high lionfish abundance, the model suggests that such a strategy requires monthly culls that remove 20% of lionfish biomass in the Carolinas and all locations to which the Carolinas are linked hydrographically. Conversely, if culls target only those locales that deliver the majority (95%) of lionfish larvae to the Carolinas, and therefore ignore those locations which contribute the remaining 5% of lionfish larvae, the requisite cull rate exceeds 60% and suppresses lionfish abundance for only five years. The latter finding exposes an intrinsic danger; sparse lionfish left uncontrolled may derail a concerted, but yet not comprehensive, effort to control the invader. This study provides a modelling approach to quantitatively target and manage the lionfish population for nations whose waters are now plagued by invasive lionfish. 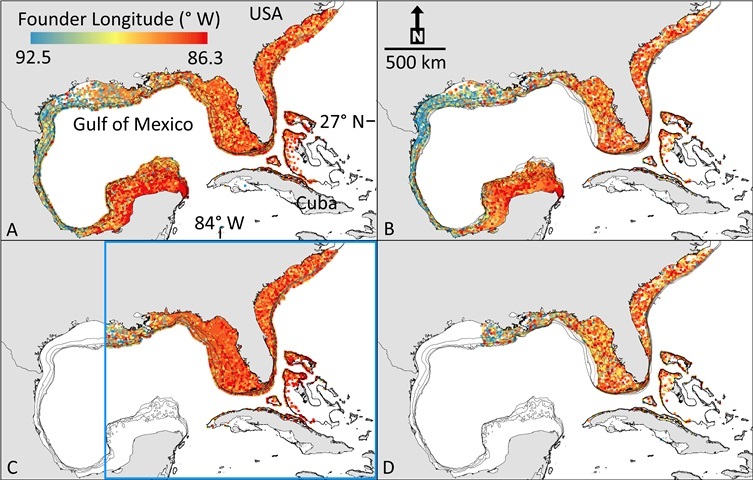 In this study, we demonstrate how perturbations to the Florida Current caused by hurricanes are relevant to the spread of invasive lionfish from Florida to the Bahamas. 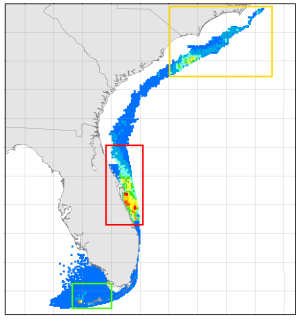 Without such perturbations, this current represents a potential barrier to the transport of planktonic lionfish eggs and larvae across the Straits of Florida. We further show that once lionfish became established in the Bahamas, hurricanes significantly hastened their spread through the island chain. 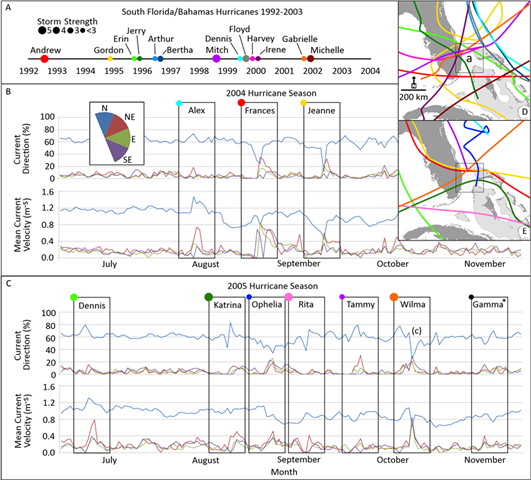 We gain these insights through: 1) an analysis of the direction and velocity of simulated ocean currents during the passage of hurricanes through the Florida Straits and, 2) the development of a biophysical model that incorporates the tolerances of lionfish to ocean climate, their reproductive strategy, and duration that the larvae remain viable in the water column. On the basis of this work, we identify 23 occasions between the years 1992 and 2006 in which lionfish were provided the opportunity to breach the Florida Current. We also find that hurricanes during this period increased the rate of spread of lionfish through the Bahamas by more than 45% and magnified its population by at least 15%. Beyond invasive lionfish, we suggest that extreme weather events such as hurricanes likely help to homogenize the gene pool for all Caribbean marine species susceptible to transport. The Atlantic invasion of Indo-Pacific lionfish (Pterois volitans/P. miles) has been as swift as it has been disastrous. Lionfish are non-native to the Mediterranean, but an invasion is perhaps even more likely than for the Atlantic. First, as for the Atlantic, there are many major cities on the coast of the Mediterranean (where aquarium-keeping is a common practice and chances of accidental and deliberate releases are high), and second, lionfish are native to the Red Sea, to which the Mediterranean is connected via the Suez Canal. Furthermore, there have already been four records of lionfish in the Mediterranean and so the pretext for an invasion is already in place. Up until now, however, it has been difficult to gauge the likelihood of an infestation of lionfish in the Mediterranean as, unlike the Atlantic, this sea has not been examined in terms of its hydrodynamics, ocean climate, and bathymetry, all factors known to be relevant to assessing the possibility of invasion. 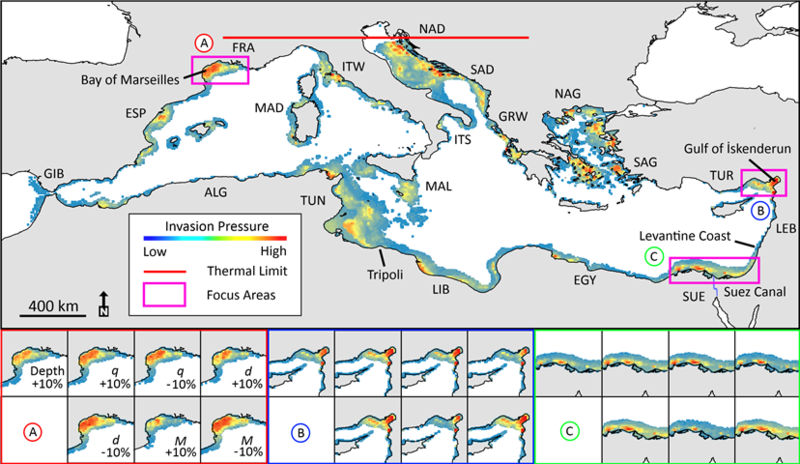 Motivated by this knowledge-gap, this study used remote sensing and computer modeling to investigate the connectivity between areas along the Mediterranean coastline that fulfill the necessary physical criteria to serve as potential lionfish habitat. Model results from the Mediterranean were compared and contrasted to those from the Atlantic and eastern Pacific. The Atlantic was considered because the lionfish invasion there has been voracious. Meanwhile, the eastern Pacific is interesting as a site without native lionfish, but with plenty of opportunity for their introduction, but no invasion yet recorded. Results indicated that, unlike in the Atlantic, connectivity among potential lionfish habitats in the Mediterranean was low in the study and comparable to that in the eastern Pacific. 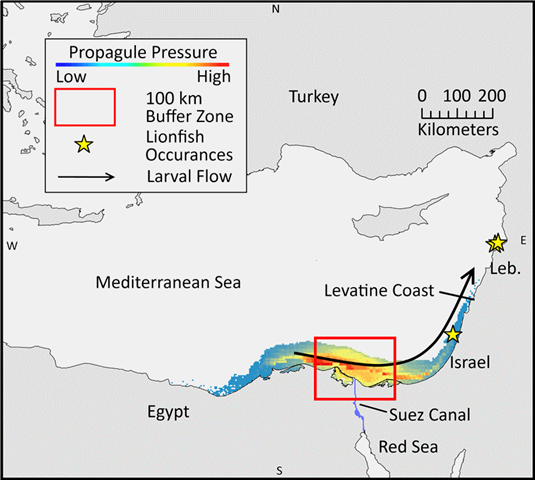 Although oceanographic conditions in the Mediterranean were found unfavorable for wide dispersion of lionfish larvae, hotspots where numerous lionfish sightings would forewarn an impending invasion were identified. This paper can therefore serve as a guide to the most efficient monitoring of lionfish in the Mediterranean and to where removal efforts should be concentrated, should the species become established. The lionfish invasion in the Atlantic and Caribbean has proceeded with vigor since their introduction in the 1980’s or early 1990’s. Lionfish effect recruitment of juvenile fish to reefs and are found in densities far surpassing that of their native Indo-pacific. There is concern that this voracious predator may become introduced and proliferate in the eastern tropical and north Pacific, through aquarium releases, transport on floating debris, or passage through the Panama Canal in ship ballast water. This study presents the first known prediction of the potential for establishment of lionfish in the eastern tropical and north Pacific Ocean, encompassing a region from 0° N to 40° N latitude. This study compares and contrasts the dynamics of hypothetical introductions of lionfish in the Pacific and Atlantic oceans in order to highlight the different dynamics of an invasion. Transition matrixes are constructed to illustrate connectivity between discrete precincts and settlement densities are calculated to indicate potential for establishment of breeding lionfish populations. This study suggests that lionfish, which are very successful in the Atlantic, may not be as efficacious in the Pacific due the lack of equitable conditions for the species. Additionally, the study indicates that connectivity within the Pacific study region is not conducive to the rapid spread of larvae over great distances. The Indo-pacific panther grouper (Chromileptes altivelis) is a predatory fish species and popular imported aquarium fish in the United States which has been recently documented residing in western Atlantic waters. To date, the most successful marine invasive species in the Atlantic is the lionfish (Pterois volitans/miles), which, as for the panther grouper, is assumed to have been introduced to the wild through aquarium releases. However, unlike lionfish, the panther grouper is not yet thought to have an established breeding population in the Atlantic. Using a proven modeling technique developed to track the lionfish invasion, we track the potential spread of panther grouper in the Atlantic. Pterois volitans and Pterois miles, two sub-species of lionfish, have become the first non-native, invasive marine fish established along the United States Atlantic coast and Caribbean. The route and timing of the invasion is poorly understood, however historical sightings and captures have been robustly documented since their introduction. Herein we analyze these records based on spatial location, dates of arrival, and prevailing physical factors at the capture sights. Using a cellular automata model, we examine the relationship between depth, salinity, temperature, and current, finding the latter as the most influential parameter for transport of lionfish to new areas. The model output is a synthetic validated reproduction of the lionfish invasion, upon which predictive simulations in other locations can be based. This predictive model is simple, highly adaptable, relies entirely on publicly available data, and is applicable to other species. Johnston, M.W., Purkis, S.J. 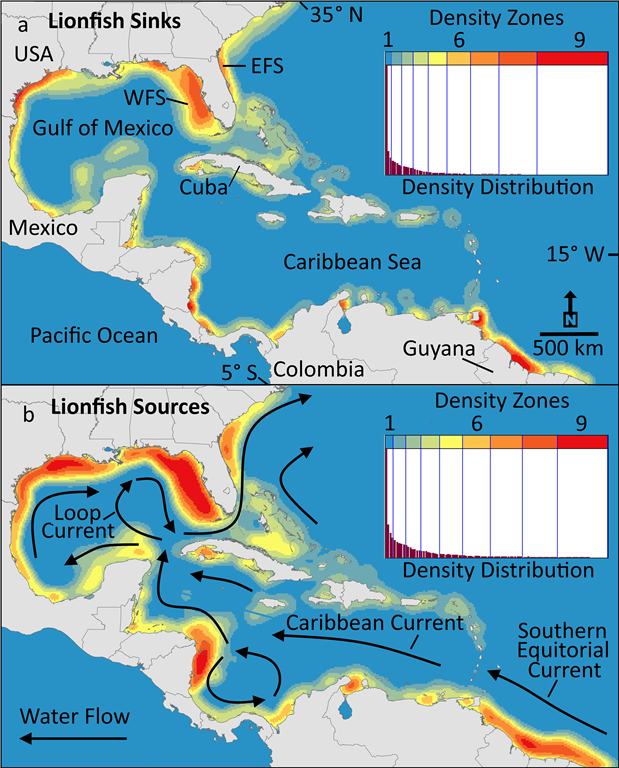 (2011) Spatial analysis of the invasion of lionfish in the western Atlantic and Caribbean. Marine Pollution Bulletin 62 (6), 1218–1226. CONCH KEY, Florida—Fisherman Gary Nichols, who has been finding lionfish in his lobster traps off the Florida Keys for years, has noticed something different this year: Lionfish are eating each other. Cannibalism may seem like nature’s way of coping with Florida’s growing lionfish invasion, but it is unlikely to offer a cure. Visually stunning with their maroon and white stripes and long, fanlike fins, lionfish are considered the most destructive exotic species in marine waters off Florida and the Caribbean. They have voracious appetites and consume dozens of organisms in one feeding, drastically reducing other fish populations and altering delicate reef ecosystems. In addition, lionfish can lay up to 30,000 eggs every four days, and their venomous spines leave them with no known predators in Florida waters. DNA evidence has confirmed that lionfish in Caribbean waters are engaging in cannibalism, and researchers are trying to determine if it's because the fish is depleting its existing foods, such as gobies and snapper. Off the Florida Keys, Nichols used to find shrimp and other small invertebrates in his lobster traps, but he has noticed a steep decline. He suspects that lionfish are eating the crustaceans, and because that can’t satisfy them, they are resorting to preying on each other. "I've seen a lot bigger lionfish [this year] and I'm seeing lionfish full of lionfish," he says. "They're eating all the little stuff up. I think because they've eaten up most of their food sources... now they're eating other lionfish." Cannibalism does occur in some species of reef fish, but it is rare, according to marine scientists. A study of stomach contents discovered cannibalism in four of 130 lionfish collected in the Bahamas, with similar results from a study of 157 in Mexico. Due to a lack of research, it's unclear if lionfish cannibalism is holding steady or increasing. "If we saw an increase in cannibalism that could mean that there are so many lionfish that lionfish are controlling themselves, but I don't think it's reached that point yet," says Nova Southeastern University marine researcher Matthew Johnston, who tracks lionfish population trends. "It would be interesting to see over time if there's an increase, because I would think that would mean that they're getting close to their carrying capacity for that particular area."